Want to be your own boss in the educational space? Computers 4 Kids is a South Africa based Education/ ICT Company with its head office in Cape Town and a footprint throughout Africa and the Middle East. To date, six million learners and 20 000 teachers have completed the e-Learner content. Computers 4 Kids is now offering local entrepreneurs the opportunity to become licensees, thereby impacting on their local communities, as well as making a living for themselves. Having a 22-year record of accomplishment in the industry and an excellent reputation, the opportunity speaks for itself. Getting a foot in the door has always been difficult for entrepreneurs. However, Computers 4 Kids has come up with a business model that makes entering the market affordable. In fact, the entry cost is zero if you have your own hardware. So, 2017 should see a number of new ICT entrepreneurs starting their own businesses. The Computers 4 Kids licensing agreement is structured in a very simple way with no fine print; there are no hidden or extra costs in the package. The opportunity is aimed at any entrepreneur who is keen to tap into the education and ICT market, and could include students, internet café operators and any person who has access to hardware. Work your own hours, offering benchmarked ICT courses for students of all ages. Licensees receive access to the full suite of Computers 4 Kids's award-winning curriculum software, including the primary school, high school, educators and community packages. All CAPS aligned software integrates with classroom themes and topics that are taught at school, and high school students have access to the new and exciting K53 content. Adults use the community version, which teaches users how to create CVs, deal with SARS, create wills etc. A flat rate royalty fee of R300/month will be charged per device. So, if you have five devices your fee will be a standard fee of R1500/month with unlimited online users. Licensees must source or provide all hardware required to run the training centre, as well as the venue itself. Access to all curriculum versions is online (i.e. internet access is required). Licensees must travel to Cape Town for one full day (at their own cost) to attend training on the various curriculum versions. There is no cost for the training itself. 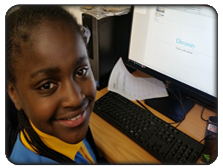 The Computers 4 Kids e-Learner courses are endorsed by ICDL SA (International Computer Drivers License) meaning you can offer internationally benchmarked certification at your centre. This offering is totally unique and only available to licensees. Additional certification costs apply for end users who require or want certification. Computers 4 Kids offers full support to licensees, including online, telephonic and email support. All marketing resources are provided electronically, including editable flyers, posters, business cards and letterheads etc. As a leader in the ICT industry, Computers 4 Kids has a team of qualified developers working on trends and new developments and technologies on an ongoing basis. In addition to keeping the content up to date and relevant, they are also tasked with researching trends and adding their own opinions and experience to the team at large. Computers 4 Kids has a strict open door policy that allows all new ideas to be expressed in a supportive environment, including input from its licensees. Development for 2017 will include the migration of the curriculum to Google Docs, Google Cardboard lessons, Microsoft Minecraft Edu activities and new programming and coding lessons for all ages. 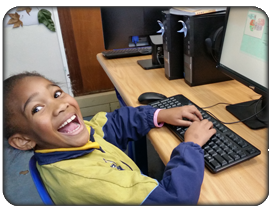 Computers 4 Kids is currently involved with the training of 384 000 Western Cape citizens and the employment of over 700+ trainers to complete this mammoth task. Work for yourself, but not by yourself. Apply and become a Computers 4 Kids/e- Learner licensee in your area. The e-Learner certification course is offered to school aged learners as well as adults. 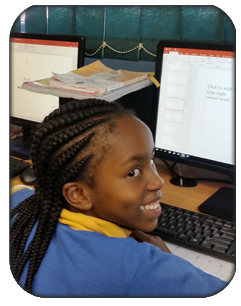 These hands-on lessons take place after school hours at the local Computers 4 Kids Training Centres and cover South African school content (maths, English, Afrikaans, Social Studies, EMS etc) as well as IT skills aimed at your child`s academic level. Your child will receive international certification from ICDL South Africa (www.icdl.org.za) on completion of the course - the only international certification offered to primary school learners worldwide. The advantage of your children attending these integrated or blended lessons are too numerous to be listed here but we are confident that the consolidation of completing classroom themes and topics as well as IT skills will stand him/her in good stead for progressing through the academic stresses that our children currently find themselves in. Our courseware is also unique in that it incorporates lessons which promote Emotional Intelligence (EQ) in children - also a first for South Africa! Courses offered to adults cover the seven units as part of the e-Learner international certification programme BUT aimed at users who do not need or require high levelled international certification but who want some form of certification covering the basic Office suite. Courses are offered in the mornings and evenings and can be tailor made to suite your requirements - even in your own home! Fun school holiday workshops are offered at all Computers 4 Kids Training Centres. These workshops allow your children to attend structured and fun IT classes during the school holidays which gives you the peace of mind knowing that they are being cared for BUT at the same time playing educational games, being creative and getting to know how to use the pc as a tool. The length and format of these great workshops are not standard - please contact your local Computers 4 Kids Training Centre for further information or to make a booking for the next school holidays! Do your staff need IT training? Basic or advanced? Do they require certification? Do you require the training to be completed at your premises? Please contact your local Computers 4 Kids Training Centre for further information or a quotation. Your local Computers 4 Kids Training Centre is now mobile! Our staff can come to your pre-school, creche or after care centre and offer IT classes to your learners in the comfort of your school using our specialised laptops. All activities are aligned to the NCS, are approved by various Education Departments and offer integration of classroom content and IT skills at its best - the ideal way to learn! Please take a tour of the pre school activities and see for yourself!